If anything cried out to be televised; it must be this. and some brilliant photographs here. Daughter and I are going to Olympia today with friends, hurrah, but this does of course mean that I will miss, oh sob, the Strictly Final. Just hope our video recorder, which is prone to fits of temperament, does the job. I am such a sad soul I actually spent time considering whether to get one of those DVD recorder machines. Once I'd seen how much they were, in view of the vast plumber's bill that just thudded through the door after what I hope is the last of our adventures with our anarchic water system, I rapidly gave up that idea. Lisa to win - I love the way that girl has fought her way through. I love singing carols, but after a bit I start to long for something that isn't the same old round of O Little Town, The First Nowell and Silent Night, much though I love them. I think this is beautifully sung. My daughter has alas now stopped watching Strictly Come Dancing with me, as all her friends watch X Factor. So, after SCD had finished (I have my priorities right) I watched the X Factor final with her - not something I think I'll repeat. Is it obligatory for everyone to cry? And did no-one think it might have been kinder to point out to Eoghan that he had a few tuning issues? The whole experience felt quite unreal - I felt as though I was sitting in a swirling sea of souped up emotion. I did wonder quite why everything felt so hyper. Is it because the contestants are living the only dream that most of the audience have, in which case I can see why things were so fervid; though it's a dreadful comment on British society if the only thing most of our young have to look forward to is the dim possibility of appearing on X Factor - one which will rapidly recede as soon as they're past their mid twenties, and what then? I shut the hens up just before the light goes; the time obviously moves, but for the past few weeks it's been at about a quarter to four. I go out and shut the hens up and then go and collect my infants from the station. I usually collect the daily egg at the same time. I have tried stowing it in various places before I go (top of the compost heap; inside the pig sty; nestling in the ivy on the gate post), but then always forget it. So, I shove it in my bag and off it goes to the station, and duly does the seven mile round trip. So far I've managed not to crush the egg in my bag, or let an incautious child sit on it. I'm sure that unlike me, you have already sorted out all your Christmas presents. I never have by this point of the year. I think though that I perform a useful social service, as everyone who asks me (and there are a lot of them) "Are you ready for Christmas yet?" can feel smug/superior/relieved/worried on my behalf/thankful they are not me. 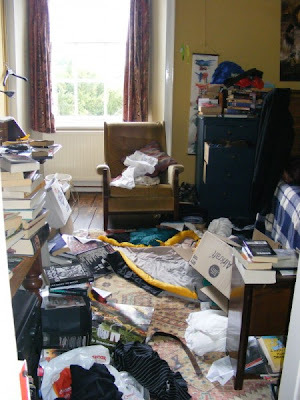 I'm sort of like the slovens in How Clean is Your House? However bad you are, you're not as bad as me. Thanks to Juliet for her post on the stripping out of words from the Oxford Junior Dictionary - a horror which had passed me by. The humble primrose, along with allotment, catkin, blackberry, and even Gawd help us, dandelion and conker - two things you'd think would be familiar to even the most urban, have gone, along with many others. I can't say I'm hugely surprised. I live in a rural-ish village, surrounded by fields, and with large woods a short walk away, and the ignorance our children have about the natural world astounds me. This summer I took our church youth group round the churchyard to see what flowers were growing, and once they'd got past buttercups and daisies they had not the remotest idea what anything was. They were very interested to learn, and amazed that I knew so many names (a childhood devoted to Enid Blyton's Nature Books saw to that, as well as the good old nature table at school). RIP. Oliver Postgate and Peter Firmin's creations were a huge part of my childhood. My sister and I can still talk Clanger (though my husband alas never has really appreciated the one I bought him a few Christmases ago, which when pressed in the tummy says "Ooh, uh uh, uh uh uh uh uh uh," which I heard on a programme about OP actually translated as "Oh, **** it, the bloody thing's broken again." Figures.) I still like it though, as does my daughter, and every now and then we release him from his cupboard and let him speak. The Clanger I mean, not my husband. One of the very first things OH and I bought together was a Noggin the Nog video, which we still have, though it must be, gasp, at least 20 years old now. Gosh. The children loved it too. I can really appreciate now, watching it again, how masterful it was: the atmospheric music, and the effective and utterly unflashy animation, but most of all the story. A cold and spiky world. Dog and I like not coming back covered with mud (particularly as the hole in my wellie is getting larger, not smaller.) Made the latest of a whole series of mental notes to go and get a new pair on the way back from the station. I like this song (but then I always did like Squeeze). My site has been a tad unreliable of late. It's a victim of its own success, as there are now far more people wanting to use it than my provider can cope with without charging me a fortune. So, I'm now changing webhosts to one which will give me unlimited bandwidth, in the hope that it will be able to cope with the ever-increasing traffic to the site. I've started the process (already spent a good long while on the phone with customer support...) but I'm told it can take up to 72 hours for the world's isps to recognise the change, so there might still be a bit of disruption here and there. BUT - I hope the change will mean everyone can access the site, whenever they want. Fingers and everything else are crossed, as whenever I make any sort of IT change, something unexpected always, always happens. Maybe, this time, it will be good something. I have mixed feelings about our house. I love its history, its quirkiness and the sense of being one in a long line of people who've lived there. I do like looking at things, like the carved panelling that has mysteriously ended up lining the boiler cupboard, and wondering "Why?" Who benefits from the credit crunch? Our dog. We don't have the heating on much here anyway, but even less so now. I am permanently buttoned into my ancient Barbour bodywarmer. And the dog, who is a warm sort of creature, is now allowed on the sofas so she can keep us warm. Not quite, "It's a little chilly, so I've put another dog on your bed," but I'm sure it won't be long. Have had a stinking cold all week, and I'm now off to join dog on the sofa, drink hot chocolate and nurse my woes. Have a lovely weekend. another posting from the far shores of equine weirdness, though I have to say despite the obvious continuity issues, I rather like this. I'd rather look at him than our Katie any day. And I want those boots. I was tagged last week by Frances over at France and the Unknown, so here, a bit late, are the results! I don't usually tag people but if anyone wants to pick this up on their own blog, and reveal six things about themselves, feel free. 1. I was a runner up in the Daily Mail (actually it could have been Daily Mirror but I can't find my copy of the book in which the results where published to check) children's poetry competition when I was 11. I wrote a poem about my grandmother, who was torn between being miffed at my not very flattering portrait of her, and pride at my brief national celebrity. Who I don't imagine will be reading this unless she's suddenly developed an addiction to internet cafés! I get a lot of messages from people who are looking to re-build their collections after they either "grew up" and chucked out their collections themselves, or as seems to happen rather more often, had their collections ruthlessly downsized by their mothers. As an aside, I do notice that fathers do not appear to do this. Presumably they either a. don't care b. don't notice the house is disappearing under books or c. prefer to leave such tricky decisions to mothers. There is now a Facebook Ruby Ferguson group for discussion of all things Jill. It's been started by John Rees, and it's here. (And thanks for the link, to Vanessa from Fidra. I whipped it off her blog having been totally incapable of working out how to find it after John rang me to ask if I minded if he linked to the website). Eek - I might actually have to join Facebook now. I have held off until now because I've heard how addictive it is and I know what I'm like, but can I resist the appeal of Jill? I don't think I can. Anne Bullen's A Pony to School. 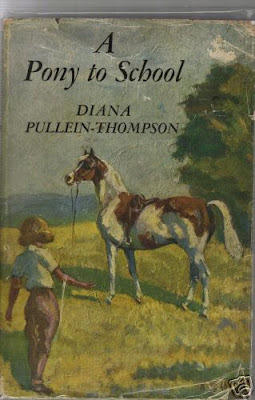 I think Anne Bullen was supreme at catching the wish fulfilment element of pony books. Her ponies are not 100% as ponies are, but they certainly are as they canter through your dreams; breedy, kindly and oh so noble. Her Cascade in Wish for a Pony was my childhood dream of bliss, as was Daybreak in I Wanted a Pony. I wonder if that's why she's won out over artists who are arguably technically more accomplished? 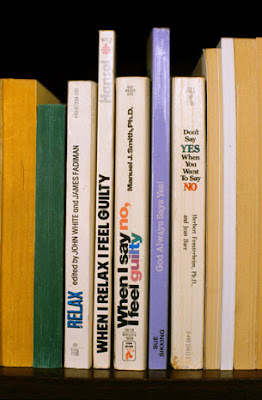 I know that when I voted in the rounds coming up to the final that the emotional pull of several of the dustjackets won out over the technical expertise of others. I'm always amazed by the sheer effort of extracting myself from my life for even a week, but we're now back, having had an excellent week, and I have now downloaded my emails. This has reminded me that I now of course have to lever myself back into my life..... Even after I'd deleted the 250+ spam, I still have 262 emails to deal with. So, if you've emailed me over the past week, please be patient. It is going to take me a time to get through the backlog. Or is Peggy Woolley THE most irritating character in The Archers? It must have been such fun though, for the scriptwriters, when it came to writing the scene where Lillian tells the hospital-bound Peggy that her Alzheimer's sufferer husband Jack has gone to a respite home. I would have been rubbing my hands with glee at the thought of writing that scene. In all the years I've been listening to The Archers I've always found Peggy utterly infuriating though she has had a few moments of humanity every now and then with her grandchildren, and of course with Jack. However, half the fun of writing for a soap must be in hitting listeners round the face with the big wet slap that is a devastating return to teeth grindingly irritating form, after you've spent some time building up the character's more positive side. (And of course show the pantomime villain Matt in a rather better light at the same time.) Boy, did they do a good job. Today, had a day off - not a book in sight. Well, that's not true, because at lunch I spotted a large bookcase full of books, which of course I had to inspect, and did see some Andrew Lang Fairy books as well as several paperback Pullein-Thompsons. But I digress. I went to a cookery demonstration by Sophie Grigson today, thanks to a kind friend who couldn't go so gave me her ticket. SG is excellent value, and sitting watching someone else cook and then test the results is certainly my idea of a good time, so I thoroughly enjoyed the day. There is very little out there for the very young pony fan starting to read for themselves. The Sheltie books are then a very rare animal: not only are they aimed at the younger reader; there’s more than one. Quite a lot more than one in fact: the series now numbers 24 (though not all by any means are still in print). Little blogging this week as I have been head down trying to wrest order from chaos and catalogue all the pony books I've bought recently, as well as do all the other things I'm supposed to. (Though at least, unlike my friend Charlotte, I am not wrestling with accounts). I've done the catalogue anyway, at last, and it'll be on line on Wednesday 15th October. I hope. Some computing blip or other always rears its head whenever I need to do a catalogue so I wait with interest to see what the current one will be. flapperty flap. Flapperty flapperty flap. You know those cutesome baby clothes with ears? This is what happens when they grow up. If you fancy a worldle, this is the link. Having tackled the emotional swirl that is Heartland, I thought I might as well do Chestnut Hill next. Chestnut Hill is a different series by "Lauren Brooke" based at a girls' boarding school in America. Its heroines are a quartet of girls: Lani, Malory, Dylan and Honey, and the series follows them through the school. In this story, Lani is under threat of having to leave the school as her poor report has made her parents think she's riding at the expense of her school work. This new(ish) series is aimed at a younger readership than Heartland. The protagonists are in Year 8, which I imagine is the same as the English one, so are aged 12-13. Those few years make a huge difference, as the emotional tempests we get in Heartland seem pretty much absent. Oh dear. Is this worse than telling a toddler Father Christmas doesn't exist? Daughter and I were talking about Lauren Brooke, whose Chestnut Hill series is on special offer in the book leaflet she had from school. "Ah," I said, in passing. "Lauren Brooke doesn't exist, of course. She's three different writers." "WHAT??" said daughter. "But how can she have a website? Is she real and then there are other people who write the books?" "Well no," I said. "There's nothing unusual about it - publishers have an idea and then go and get someone, or several someones, to write it. Like Lucy Daniels. Masses of people have written the Animal Ark books." Have I read a Booker Prize nomination? I'm not sure that I ever have - I've certainly read books by Booker nominees, but not, I think, a title which has been shortlisted. I certainly, beyond a shadow of a doubt, have read none of this year's nominees. So, in an attempt to broaden my limited intellectual horizons, there's a poll on the Ibooknet blog so you can suggest which Booker nomination I should read. I have a source of supply, I have a flicker of interest: I just need your advice now on what to choose. I mentioned this in my blog post on theIbooknet blog; but I think a full explanation of its glories is probably better off here. I never did win a Deportment Girdle in my entire school career - and yes, it really was called a Deportment Girdle. It was a crimson sash, worn tied around the waist. To a scruffy, scrawny, eleven year old, drowned in an enormous gym tunic, it seemed that all the more glamorous members of the school wore them, sashaying around the corridors, distant goddesses. But none of it is done. I sat down on the sofa, put my feet up, and watched Burghley, texting dear son to come home and walk dog (he did). Cor. BRILLIANT round from William Fox-Pitt (though why did the BBC cut the round off two jumps early?) on Tamarillo - just amazing to see, and of the young riders I was really impressed by Sara Squires and Angus Smales. Loved the commentary by Ian Stark too, and his female counterpart - who was she? Missed the very beginning but I thought she did a grand job. Far, far preferred them to Mike Tucker, who always sounds as if he should be commentating on racing. Or something like that. KP has been much in the equestrian news lately, whether it's because China White wouldn't let her in to the polo (their tent, at least), or because she's going to be appearing at the Horse of the Year Show as the subject of a dressage lesson, or because of the (oh oh oh I am LONGING to say something smartarse here but I won't because really, I don't need to) new equestrian wear range she's designed. However, she is now going to be the face of "Hoof", which wants to challenge the idea that eventing doesn't really fit into London (a point of view which I have some sympathy with) and which also, much more laudably, wants to encourage London children to ride. Here's Hoof's website. Every now and then I happen across an author who completely blows me away, and oh, the joy when I find out that the book I've read is by no means all - all those lovely things still to be read. Antonia Forest was one such, a few years ago, when I read her Autumn Term, and Helen Griffiths is now another. One advantage of being unable to do much of any practical use over the past couple of weeks while my knee has been out of action is that I've been able to catch up on my to be read pile. To be accurate, the TBR pile is not a pile; it fills several boxes and is a fluid thing, often governed by whether or not I've sold a particular book. But, prompted by the fact someone from whom I bought a large collection of books said this one always made her cry, I picked up The Wild Heart. So, we ruthlessly hurled all sorts of odd bits and pieces on to the skip - well, when I say hurled, with the price of skips these days we arranged carefully making the best use of the horribly expensive space - until we came to a particularly hideous, battered but solid 1930s mahogany sideboard. I have had this horror in my sights for years, and had meant to arm son and friends with crowbars and let them get on with it, but of course had not got round to it. Husband, although not fond of the foul sideboard, felt it had a future. Blogging has been a bit sporadic: school holidays have eaten up my time. They always do, and it always takes me by surprise, every single time. Still, I have found enough time to watch the showjumping. Excellent course building, and brilliant performances by the USA, and in particular Canada, with only 3 team members and therefore no discard score. Of course the UK were also down to three after John Whittaker's Peppermill had a stiff back, but you would have thought from listening to the British commentating on the event on BBC that this was the sole reason we didn't do that well. Well, Canada only had three and they still managed to finish in silver medal position. My daughter and I, as I said in my previous post, don't really share my passion for horses. Daughter and I don't share a few other things, either. We just spent a while in front of the You Tube, trying to find some musical ground we had in common, for surely there must be some? Daugher likes Rihanna. Don't terribly mind Rihanna myself, but want to say to her and to most R&B singers, and actually quite a few others now I think of it: "For goodness' sake put some clothes on woman!" Which is not a problem for this next lot, unless baggy yellow shorts really do it for you. Daughter and I watched this, and we are far, far apart on this one. I love it: I think it's fun, and sounds sunny, which as I am typing this in yet another bout of pouring rain, does it for me. Daughter thinks it's one of the worst things she's ever heard. What an amazing Olympics she had. She so deserved her medal: fantastic riding on all three sections. I'm glad Hinrich and Marius won - I do love that horse. And what a gripping final. My daughter, who is getting progressively more anti-horse with each passing week (can't imagine why, when she has my example to follow), was curled up elsewhere in the room when I turned the showjumping on. "You're mad," she informed me, witheringly, as I groaned my way through Mary King's round, crouched there with my head in my hands, barely able to look as she went down that final line. However, the excitement got to even her, and she joined me, hanging in front of the telly, actually keen to see what happened. Am not at my bright mental best today, husband and self having set the alarm for 1.00 am to watch the cross country. All of it, in its entirety. Despite now feeling like the little ghoul at the end of Buffy who staggers across the screen going "urgghh, arghhh," it was worth it. Mary King nearly finished me off entirely when she had an interesting take off at the Pagoda fences, but goodness, did she do well. So impressive, as were the Germans (lovely Marius) and am only sorry that Lucinda Fredericks on Headley Britannia didn't do better. It's on BBC here. I posted a few months ago about Amazon's attempt to take over the POD (print on demand) market. Booklocker filed an anti-trust suit against Amazon. Things have now become rather heated: Amazon filed a motion to dismiss, and Booklocker then filed a counter motion. You can read a summary of the arguments here. The motion will be ruled on after Labor Day, which is 1 September 2008. The POD market is not the only one Amazon has its eyes on. It has now (subject to closing conditions) bought ABE. The Advanced Book Exchange is an internet site bringing together antiquarian and other booksellers to sell books. ABE is a very long way indeed from being perfect, but it was at least independent of Amazon. I've blogged at length about this new development, and its possible impact on booksellers on the Ibooknet blog. here. I am so excited. I have booked tickets, though have no idea if any of my nearest and dearest will want to come with me. I do not care. I am going no matter what. I am a keen devotee of America's Fugly Horses blog, which aims to expose duff horse ownership and breeding practices. Through that blog, I have learned quite a lot about American slaughter practices. It is no longer legal to slaughter horses for human consumption in America; but there is still a market, and slaughter for human consumption is still legal in Canada and Mexico, so horses are bought in bulk by the kill buyers and have to endure long trips across the border to slaughter.